This was a yummy veggie pie. Put the potatoes into a saucepan and over with water. Bring to the boil and cook for 10-15 mins until tender. Drain and return to the pan. Add the milk and mash well. Season. Heat the oil in a frying pan and fry the veg for 5 mins. Transfer to an ovenproof dish. Meanwhile, melt the butter in a small pan, stir in the flour and cook for 1 min. Gradually add the milk stirring constantly until thickened. Stir in the mustard and 20g cheese, season and pour over the veg. 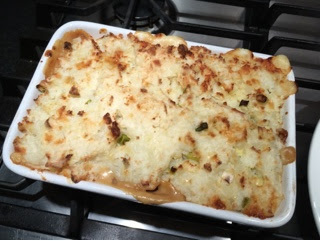 Mix the remaining cheese and spring onions into the mash and spoon on top of the veg. Bake for 30 mins until golden.